ArcticCross: ArcticCross #1 to feature picnic! The ArcticCross race committee will be providing all the fixings for most excellent grilling after the race on Saturday. 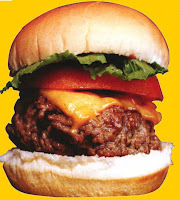 As many people know, a proper post-race meal should include a healthy dose of protein, so we will be providing hamburger patties, buns, and condiments to grill after the race. If you want to bring anything else to share, bring it with you! The Abbott Loop Community Park off Elmore Rd. has a great picnic facility and pavilion, so make sure to stick around after the race. Warning: Do not attempt to eat burgers like this unless you have the strong heart of an ArcticCrosser! Thanks for the burgers! Had a blast today! Yea Bill, Bruce, and ALL the Volunteers. THANKS a TON for the fun and food.